A late-summer- and autumn-blooming plant that I still found flowering around Austin in early November is Lindheimer’s senna, Senna lindheimeriana. This one in Great Hills Park on an overcast November 4th exhibited buds, a flower, and several pods simultaneously. You can read more about this species in an article by a member of the Boerne chapter of the Native Plant Society of Texas. 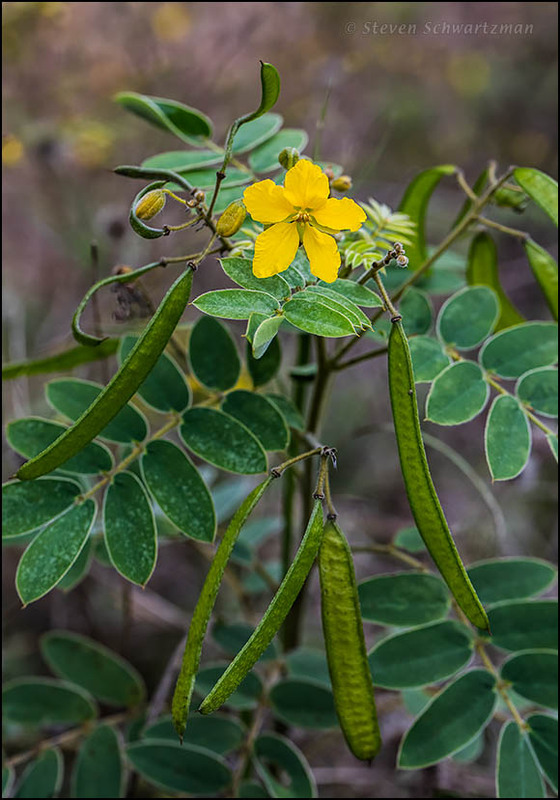 Among other things, I learned that an alternate name for Lindheimer’s senna is puppy dog’s ears, a reference to the softness of this plant’s leaflets. What a delight — just like having an old friend show up overnight. When I found this plant on my road trip, there weren’t any pods that I recall. I’ll look for them in the future. I’m amused to see that I commented on your other senna posts. Obviously, I read there about Lindheimer’s home, his history, his work with Texas plants, and so on. But the details didn’t stick until my visit to the Lindheimer exhibit at the Sophienburg, and Lindheimer’s home. On the other hand, I might not have noticed the exhibit or made plans to go if I hadn’t bumped into Lindheimer here. The learning process is a fascinating thing. When I saw your photo of Lindheimer’s senna the other day I’d already prepared this post of my own. The species is common in central Texas and I can count on finding it as close as half a mile away in Great Hills Park, as shown here. I’m glad you got a good look at the pods here: too bad they’re not edible. Even if they were, I doubt many would want to eat them, because you may have noticed that the plant is rather unpleasantly scented. I don’t know if you handled the specimen you photographed; if so, I suspect you would have noticed that odor along with the softness of the leaflets. As you point out, reading about a thing isn’t the same as experiencing it. In addition, those of us who read a lot have that much more that can slip into oblivion. Think of the thousands of comments we’ve left on other people’s blogs and in reply to comments on our own. Who can remember all the things we’ve said and seen? We did spend time looking at the plants, because they were growing straight out of a mix of caliche and rock, and my friend thought they’d do well at her place, where plants like mountain pinks thrive. In the process of trying to decide what they were, we crushed some leaves, but I don’t remember any scent, unpleasant or otherwise. On the other hand, I hadn’t noticed there are pods in my photo, too. They’re much smaller, but they’re there. I suppose I was more interested in the flowers and buds, and focused on those — in every sense of the word. Speaking of which: the way you’re able to get so much of this plant in focus amazes me. It certainly helps to highlight the various shades of green. I looked back at your picture just now and saw the small pods you mentioned. I’d forgotten how many more flowers and buds your specimen had than mine, which partly compensated with its fully developed pods. I’m guessing that the plant put a lot of energy into creating and developing them, so there was little left for new buds and flowers. On the technical side, I see that I was able to stop down the aperture to f/7.1, small enough keep the main features of the senna plant in focus. This puppy dog is a botanical artist’s dream, presenting bud to seed pod all at once! I love your photo of it. There’s a saying in Texas (and elsewhere): “That dog won’t hunt,” meaning that something won’t work or isn’t valid. From what you say, this puppy dog will hunt for you, and I’m pleased to hear it. The pleasant feel of the leaflets is caused by lots of small, soft hairs, which also act to hold raindrops in place. That would add another element to a botanical artist’s depiction of this species. It would indeed. Small white hairs are a bear to render in pen and ink. I just took a look at a photo I’d taken of Lindheimer’s senna leaflets with raindrops on them. The little hairs are barely visible; they look more like texture than like separate objects, so you probably wouldn’t need to put them in individually. Yes, right. I drew a Pasque Flower a year ago or so, that has long hairs. I drew those by grouping them, the way I’d do fur, and by placing a dark leaf behind for contrast. Can you point us to an example you’ve posted online? Another member of the pea family. Nice pods. Yeah, those Fabaceae species are like peas in a pod. And if I can accumulate enough pictures of them we can have a podcast. My impression is that these flowers are under-appreciated. Why do you consider them royal? wasn’t this flower the royal insignia for France’s kings? If you look at the royal dress from Ludwig XIV for instance at Wikipedia, there he has a wonderful blue cape with golden iris lined with ermine. Actually the French fleur-de-lis is a stylized lily, whereas sennas are members of the bean family. That’s a good comeback. The next time I run into a Mr. Bean I’ll see what he’s wearing. I always enjoy an image that portrays the several stages of a plant’s flowering. This is a good one. The pods make me hungry for some snow peas. All the world’s a stage, so this senna is three worlds. I’m sure you’ll find snow peas much more savory than those of the senna. And less likely to irritate the bowel. They are very pleasing to the eye, though. We can consider it an example of “eye candy”. ¿Hay especies de sena cerca de ti?